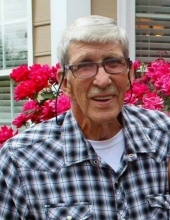 George Barnhill, age 76 of Old Corbin Pike, Williamsburg, Ky. went to be with the Lord Sunday March 17, 2019 at his home. He was born September 30, 1942 in Verne, Ky to the late William Barnhill and Eva Collier Smith. Along with his parents he was preceded in death by 2 sisters; Zola Rains and Odie Susan Barnhill, 1 nephew; Harold (Bo) Rains, and 1 daughter-in-law; Cindy Barnhill. He is survived by his wife of 31 years; Brenda Barnhill, 3 sons; David (Diana) Barnhill, Darryl Barnhill, and Anthony Barnhill (Amanda), 1 stepson; Jeff (Amy) Vanover, 2 stepdaughters; Dee Vanover (Jamie) and Julie (Bill) Ball, 13 grandchildren, 6 great grandchildren, 1 sister; Louise (Glen) Walters, 4 nieces and nephews, and several great nieces, great nephews and a host of relatives and friends to mourn his passing. Funeral service will be 1:00 pm Wednesday March 20, 2019 at Ellison Funeral Home Chapel with Rev. Harold Long officiating. Interment will be in the Maple Creek Cemetery. Visitation will be 11:00 am Wednesday March 20, 2019 until the funeral hour at the funeral home. American Legion Post 88, Corbin, Ky. will conduct military graveside honors. To send flowers or a remembrance gift to the family of George Barnhill, please visit our Tribute Store. "Email Address" would like to share the life celebration of George Barnhill. Click on the "link" to go to share a favorite memory or leave a condolence message for the family.